Ringna no oro or olo , smokiness is what defines this dish and is so finger licking good. An earthy smoke scented aubergine puree that blends beautifully with spices, herbs,yogurt and this tantalises your taste buds, surely your love for aubergine will become deeper and deeper. 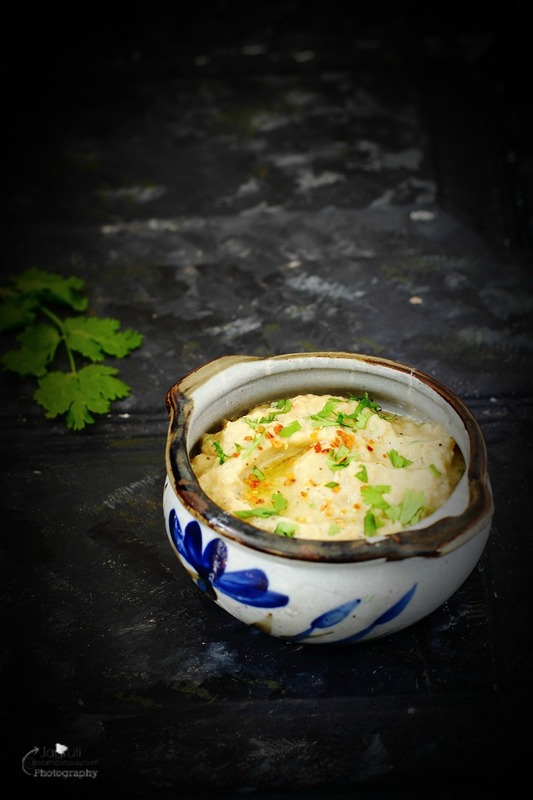 If you like to devour Baingan Bhartha ,Baba Ghanoush /Ganoush or any other smoky aubergine dip, then surely this dish will make its place in your heart. Ringano oro is an authentic dish, hails from Kathiyawad, Gujarat, especially popular amongst farming community during winter season. Ringano oro recipe sounds similar to Baingan Bhartha, but it's not. I would say taste wise this dish is no way near to Baingan Bhartha. Baingan Bhartha recipe is made with charred roasted aubergine and once again cooked with fresh herbs, spices and tomatoes, where as this Ringano oro is prepared using charred roasted aubergine, fresh herbs, garlic chutney , raw oil and does not require any further cooking. Ringano oro tastes great with Hot Millet flatbread ( Bajri no Rotlo ), as a main meal and can be served as starter dip with crackers or toasted pitta bread too. This recipe is not mine, since I was young I heard a lot about it, once or twice husband mentioned that his mum used to make Ringano Oro, but I never tried as I did not have an authentic recipe, until a friend from Kathiyawad, highly spoke about it few months back. Since she gave me her family recipe, we demolished many bowls of Ringano Oro, oh and did I say that even daughter liked it too !!! Fresh herbs, garlic and peanut oil adds a lovely flavour to Ringano oro and yogurt cuts down the hotness from the fresh green chilli and garlic chutney. Instead of garlic chutney , you can add fresh minced garlic cloves and red chilli flakes. 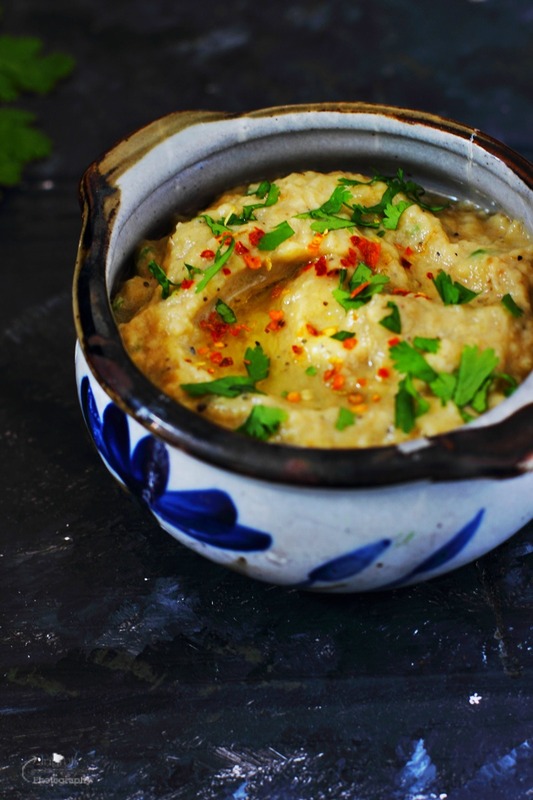 A Kathiyawadi Gujarati Style Smoky Aubergine Dip so delicious and goes nicely with millet flat breads. Wash and pat dry aubergine. Roast aubergine with the skin on, on an open fire until aubergine is soft and no longer holds it's shape. Once charred , remove from the fire and let it cool . When cool, scoop out the insides, mash the flesh in a bowl with the fork until smooth or use blender. Add all the other ingredients and mix well. Serve at room temperature with the another tablespoon of peanut oil and a sprinkle with little red chilli flakes. Serve with hot millet flatbed, chaas ( buttermilk ) and more garlic chutney. Enjoy ! Oh my gosh. I would love this. As usual, your pictures are lovely. Hope you are doing well. Thank you Lisa, I am good..thank you ! Hope you are doing well too, my best wishes. Do try this recipe, I am sure you will love this. This looks so delicious, and healthy too! I love eggplant/aubergine, prepared this way!! I love eggplants!! and this dip looks insanely good! I could probably eat all of it :) Love the smokiness too. At first, I wasn't sure what this dip was, but the realized that aubergine is eggplant! Yes, I love eggplant anything! And I love the smoky factor of your dip! Yum!!! Mmmm. This looks so tasty! I love all things eggplant and can't wait to try this! My family is going to love this recipe!! I love this recipe uses fresh ingredients and just a few to boot, too. This would be perfect to make on a busy weeknight! I love eggplant. This looks so spicy and delicious. It would make a perfect party appetizer. Can't wait to try it out! Well this sounds like a delicious dip. I happen to love this sort of thing as an appetizer or to use in a wrap. Eggplant is delicious, and I am always looking for new ways to use it. I love the smoky flavor...sounds like a delicious dip! I love the shot! Beautiful picture! I am definitely making this one! Wow what a lovely variation to Bharta.. Will try it for my next party. Looks so delicious and healthy too ! I like how you have used yogurt in this recipe, I go the onion tomato route. would love to try this variation.